This week we celebrate the two-year anniversary of the signing of the Executive Order creating the National Export Initiative (NEI), when President Obama set the ambitious goal of doubling U.S. exports over five years. Exports are a bright spot in our economy, and are helping to fuel our economic recovery. Here in Baltimore, exports are helping to support local jobs, local businesses, and are an important part of the region’s economic future. How Has Exporting Helped Your Business? Here at the International Trade Administration, we’ve helped to coordinate 77 trade missions to 38 countries with 1,123 companies participating. In case you didn’t know, that’s a lot. A whole lot. These companies have reported that they’ve secured more than $1.25 billion so far in export sales as a direct result of these trade missions. The success of the NEI depends on your successes. We invite you to share your export success stories with us. How has exporting helped you and your business? One of the primary tools of the National Export Initiative (NEI) is the U.S. merchandise trade statistics captured by the Foreign Trade Division of the U.S. Census Bureau. Examining the trade statistics provides a business with the information needed to make efficient and effective decisions for their export strategy. The Minority Business Development Agency (MBDA) did a deep dive into the 2007 Survey of Business Owner data released by the U.S. Census Bureau and found minority-owned firms are more likely to export compared to non-minority-owned businesses. Export activity of minority-owned firms spanned 41 countries, with Mexico, Brazil, and the Dominican Republic dominating the list. 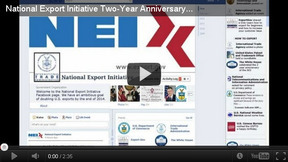 This week marks the second anniversary of the National Export Initiative (NEI), established by President Obama with the ambitious goal of doubling U.S. exports by 2014. The United States Patent and Trademark Office plays an important role in three of the initiative’s central efforts: removing barriers for American businesses and expanding their access to foreign markets, providing global education and training to better enforce trade rules, and promoting trade and exports. Commerce Secretary Bryson lays out priority of "Build it Here, Sell it Everywhere"